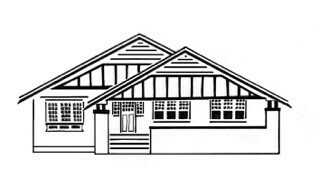 The bungalow was the most popular form of housing in Australia in the twentieth century. The Californian Bungalow was amongst the earliest of the twentieth century bungalow styles. This earthy and unpretentious style was based on a distinctive type of rustic, Japanese-influenced single storey detached house which developed in the Los Angeles suburbs to become the standard unit of US west coast suburbia by the outbreak of World War I. The Californian Bungalow was imported to Australia in 1916 by an Australian Real Estate Agent who assembled it for a show held in the Sydney suburb of Rosebery. For many Australians, Hollywood provided a glossy image of an American way of life and California was seen as a model for what Australia might one day become. California and south-eastern Australia had certain similarities of climate, topography and vegetation (the eucalypt being an Australian ‘export’ to California). There was also a historical parallel with simultaneous discoveries of gold in the mid- nineteenth century boosting the development of both regions. By the early 1920s, speculative builders had embraced the style, and it proliferated until the Great Crash of 1929. 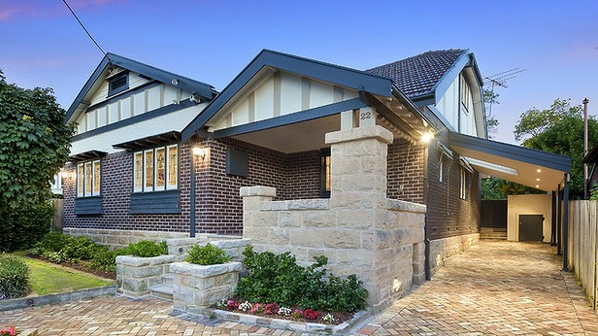 The virtually standardised Australian version of the style was usually built in brick rather than in timber, and it featured a range of chunky carpentry details applied to houses which in other respects were not greatly different from those of the preceding decade. It underwent regional adaptations with the Sydney version built in local liver-coloured brick. Exposed rafters and barge-boarded gables facing the street. Bargeboards are visually prominent but plain, often with raked edges to accentuate the sweep of the roof. Simple designs of strap-work, shingling and ventilators are common end gable in-fills. Occasionally walls are pebbledash though pebbledash accents are more common, for example, on heavy tapered masonry verandah pylons or as in-fills on low veranda walls. Window frames, often mounted on the outside face of the wall, sometimes have skirts of shingles or boards. A separate garage, typically for a single car, began to appear to the side and behind the house in the backyard. Post and wire fences replaced the timber picket fences associated with the former Victorian and Federation styles.